I’ve been missing because work got crazy. Then I got sick. Finally we went on a long vacation – 10 days away. My life was insane! Any who, I’m going to be sharing what we ate while in both Universal Studios Florida and while we were on the Walt Disney World property. We actually visited the parks while at Universal. While we were in Walt Disney World, we visited 10 different resorts and Disney Springs. One of the places, we visited was Port Orleans – French Quarter. I had heard about the beignets being sold there. 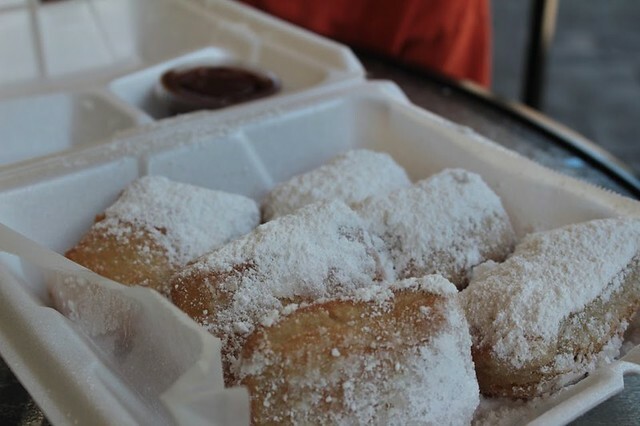 In fact, that is the only place that beignets are sold on property. We took a ferry from Disney Springs over to Port Orleans. It was almost like floating into a bayou. So cool! The family love the beignets which are deep-fried pastries. We dipped them in chicory chocolate sauce. Yum! After we were done with visiting Port Orleans, we visited Earl of Sandwich in the Marketplace area of Disney Springs. 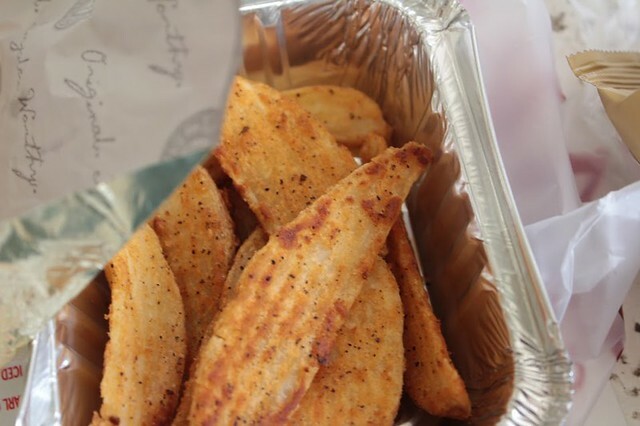 Hubby got himself an Italian sandwich and potato wedges. Since it was the day before Thanksgiving, I got myself a holiday Turkey sandwich. 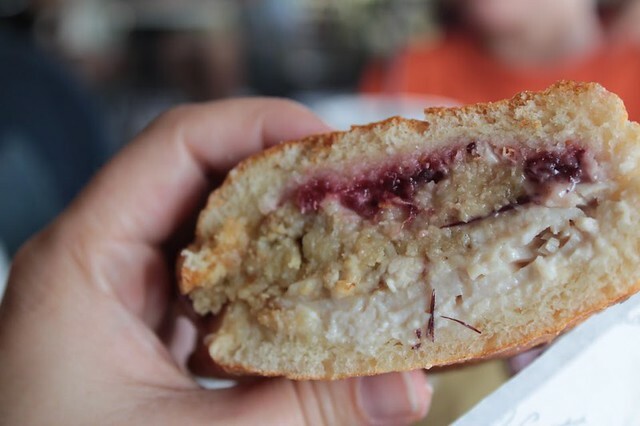 The sandwich contained turkey, stuffing, cranberry sauce, and mayo. It was delicious! 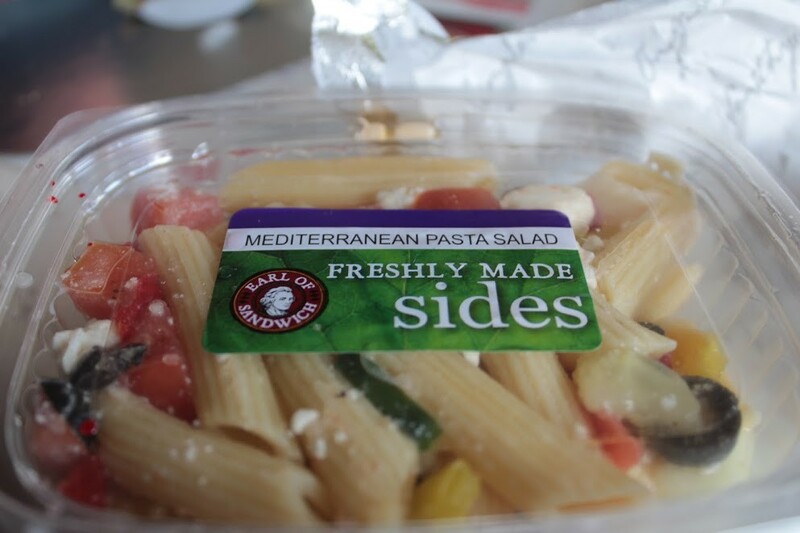 I also got this pasta salad. I ended up not eating until dinner time. It was delicious. 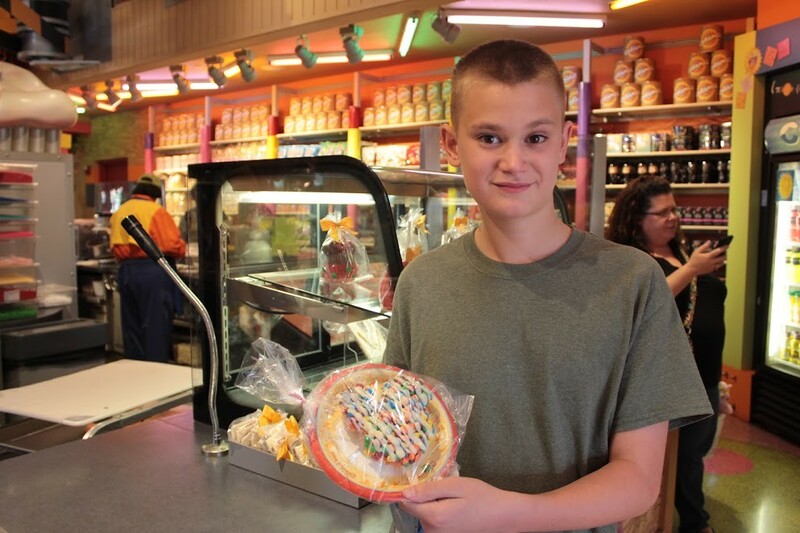 After our 2014 trip, we found out about the made to order Mickey head Rice Krispie treat. The Imaginative One really wanted one so we allowed him to get one. He had it dipped in chocolate and then topped with mini M&M’s and white chocolate drizzle. I thought he would have some of the Rice Krispie treat left over for later. He ended up eating the whole thing in about 10 to 15 minutes. 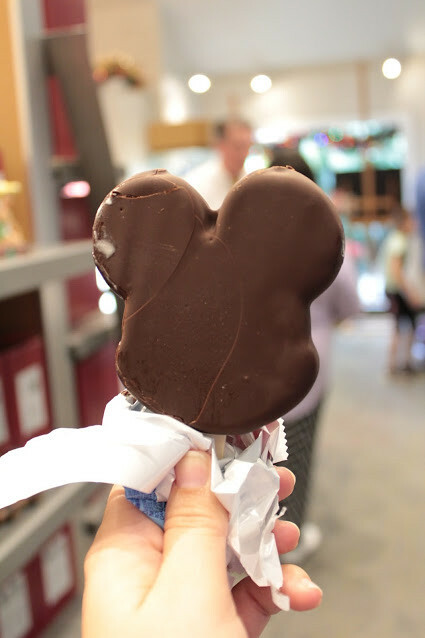 One of my favorite treats in Walt Disney World is their Mickey Ice Cream bar. I know it’s just ice cream coated with chocolate. However there is something magical about eating it when it is shaped like a Mickey head. 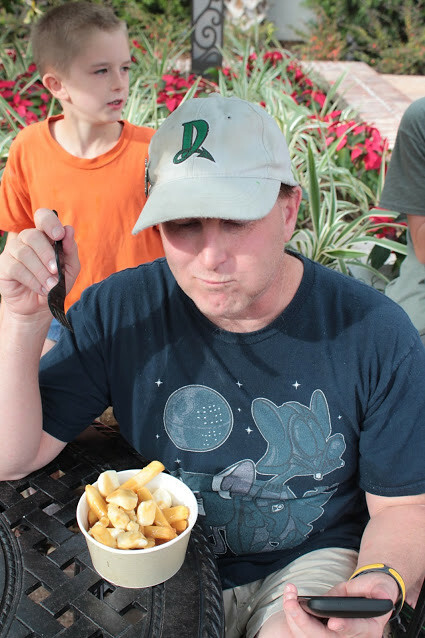 Hubby has loved poutine ever since we came home from Niagara Falls. 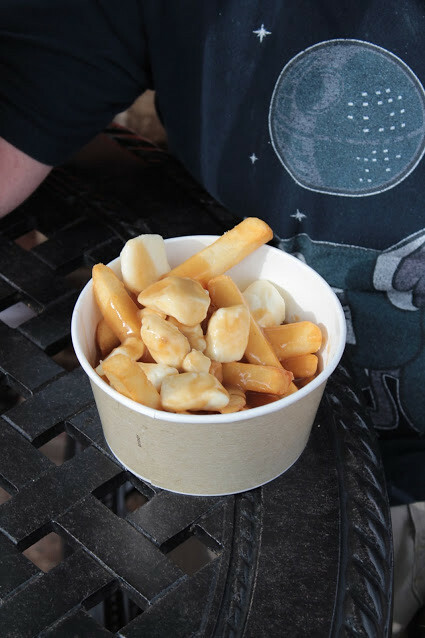 I knew there was a quick service counter that sold poutine in Disney Springs. However, I did not know where it was located. While we were in the Lego Store, I needed to go to the restroom so I went looking for the nearest restroom. I ended up finding the quick service restaurant that sold poutine. Boy was Hubby glad when I showed him the restaurant! On a side note, he had been wanting to get a soft pretzel but the line was ridiculous so he did not get one. He was delighted that he ended up not getting that soft pretzel. We went to see Moana while we were at Disney Springs. Even though the majority of us did not eat anything during the movies, the Imaginative One had some popcorn. I could not take a photo of his popcorn. 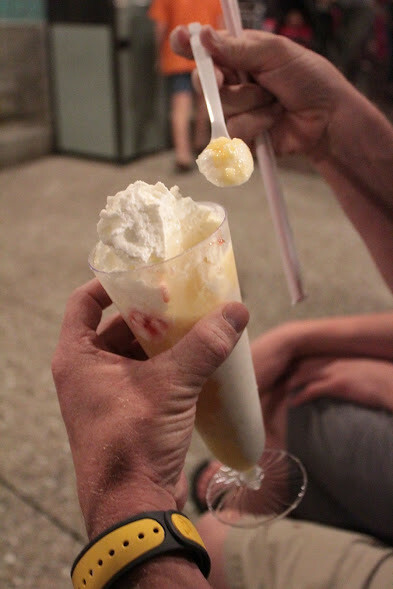 After the movie, Hubby and I got gelato floats from Violi il Gelato. 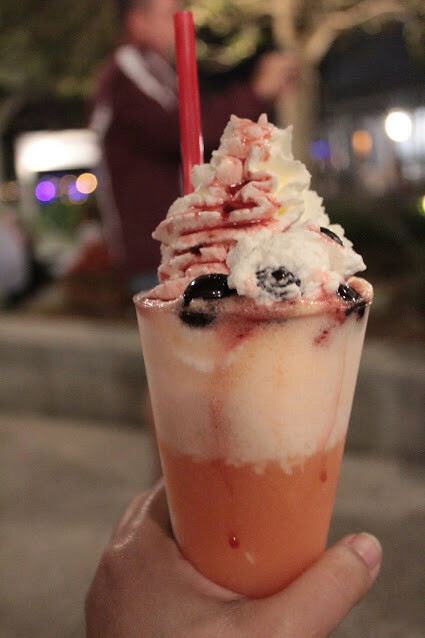 I got a Topicale float with coconut gelato, pineapple sorbet, blood orange juice, pineapple, whipped cream, and cherries. Yum! Hubby got a Creamsicle float with vanilla gelato, orange Sorbet, orange Soda, and whipped cream. They were expensive in my opinion. Almost 10 dollars each so they were a special treat. 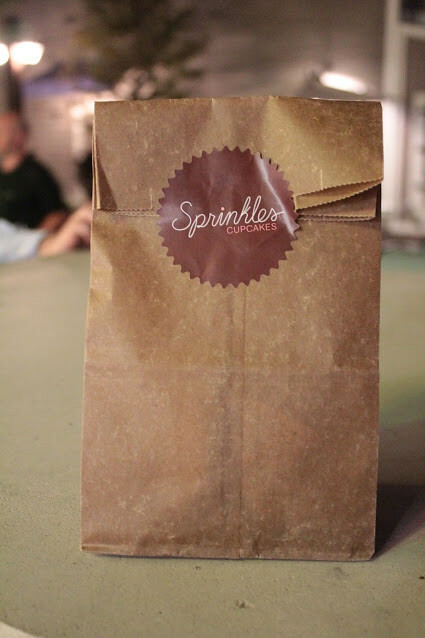 I had wanted to find a bakery called Sprinkles while we were there. I finally found it and got myself a strawberry cupcake. It was okay. Not worth the hype in my opinion. We have a great local cupcake shop that has spoiled me with their deliciousness. Afterwards we went back to our hotel room and ate dinner there. Join me later when I share what we ate in Universal and more of Disney. I love disney food! Great post!